directions to make an adult pose, child pose, or animal pose. the end of the tutorial. Blender – See the About Page for the particular version of Blender needed for the current version of the CLIPTool. 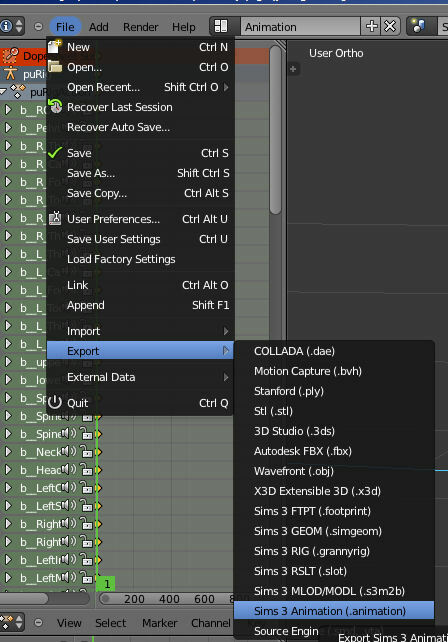 Note the correct version of Blender is required for optimal results using the CLIPTool. 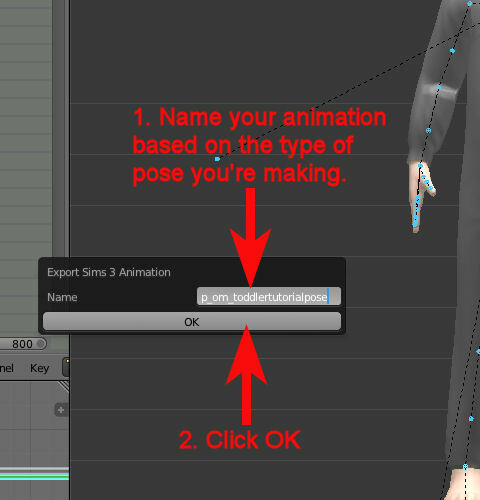 NOTE: The rigs used for AnimTool will not work with CLIPTool and vice versa. Download all of the above. 1. Install Blender according to the instructions. 2. A’s Instructions show HOW TO INSTALL THE CLIPTOOL once you have Blender installed. 3. 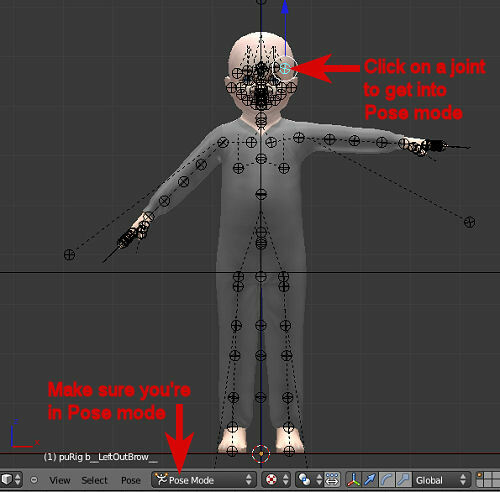 Put Pose Player .package into your Mods folder. 4. Create a folder and name it something like ClipToolRigs. Open the rigs.rar and put the rigs into your new folder. 1. 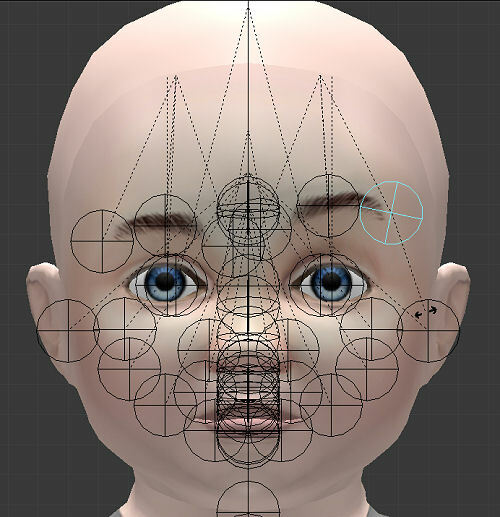 Open Blender and then open the toddler rig. It is the one named puRig.blend. Right mouse click on the joint you want to rotate. It will turn light blue indicating it is selected. * For precise views place your mouse in the 3D view box and click a number on your keyboard number pad. 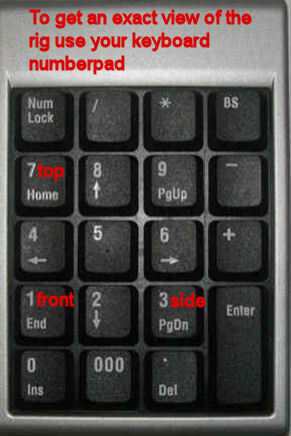 * To reverse the view hold down the Ctrl key on your keyboard while clicking a number on the number pad at the same time. 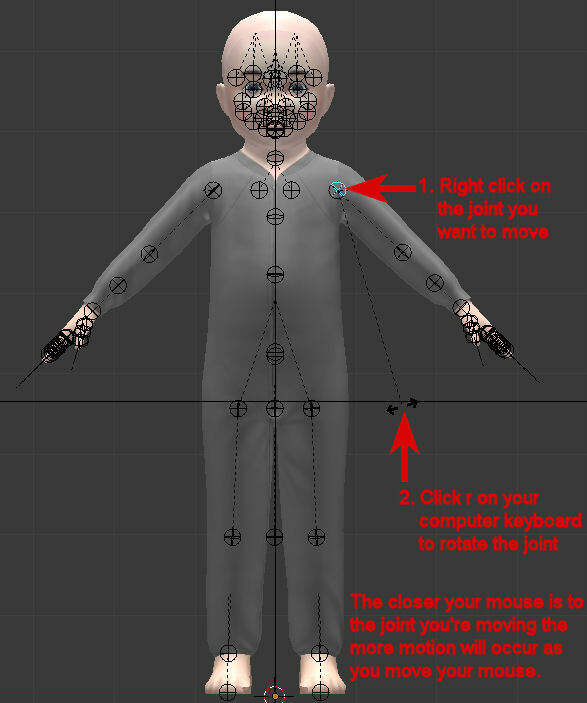 * To zoom in and out place your mouse in the 3D view box and scroll your scroll wheel. 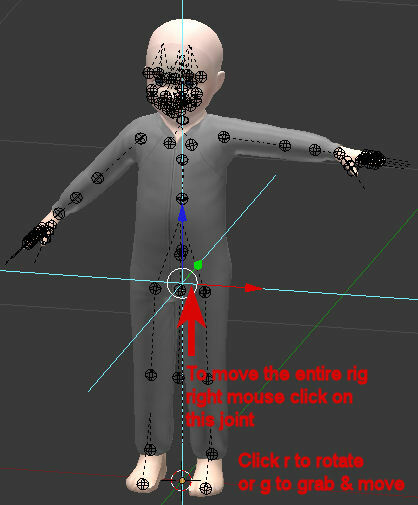 Click on the large joint that is centered around the rig’s pelvis to select it. Once selected it will turn light blue. Click r on your keyboard to rotate it or g to grab and move it. have a good view of the stomach area. joints and reposition them as usual. Use the middle mouse button to scroll in and out to see how your work is progressing. Make sure you’re in Pose mode. plus sign next to that. mouth joints are under the EyeArea, MouthArea, and NoseArea headers. To select a joint on the list click on the name of the joint and the corresponding joint on the rig will turn light blue. Click Ctrl on your keyboard, hold it down, and click the z on your keyboard. 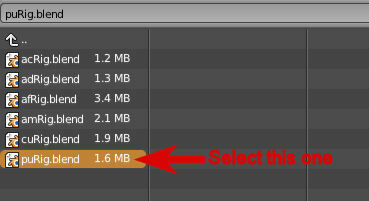 Once all the joints are selected click the i key on your keyboard to bring up the Insert Keyframe Menu. 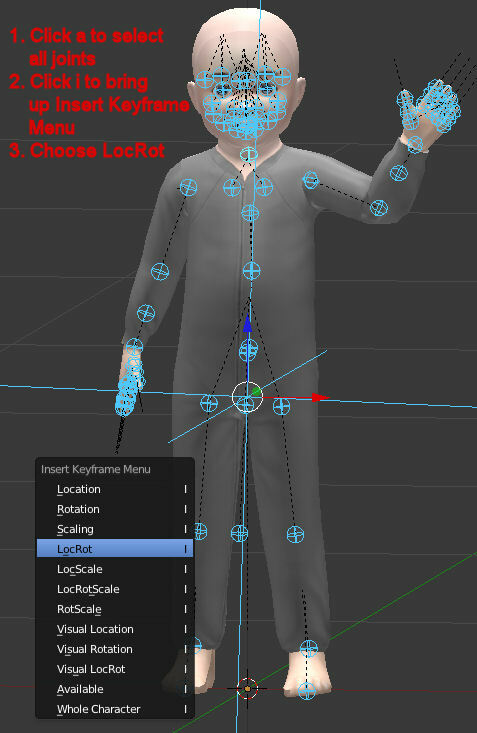 On that menu choose LocRot to set the keyframe. ** NOTE: THIS STEP IS IMPORTANT & IF YOU DON’T DO IT ALL YOUR WORK WILL BE LOST. This is what turns all the changes you’ve made to the rig into something that can be saved. 2. A small popup box will appear. Type the name you want for your pose into the blank line and then click OK.
you click OK or your pose will explode in the game. NOTE: The name you choose during this step is the name you must type into the Pose Player to see your pose in the game. long number in front of it. Just leave the name alone. ** Do not change the name. Just look over in the upper right corner and click the Save Sims 3 Animation button. 3. Navigate to your working folder. Select your .animation and click Open. 4. When the popup box appears just click OK – do not change anything. 5. Then click File and save the .package. I usually use the same name I gave the CLIP just to make it easy to remember when testing it in the game. Now you’re ready to install the .package into your mods folder and test in game. If you have questions about the tutorial or run into problems following it please leave a comment detailing the issue. for some reason when i click extract it doesn’t have the “animation” option whyyy? can you gelp me???? 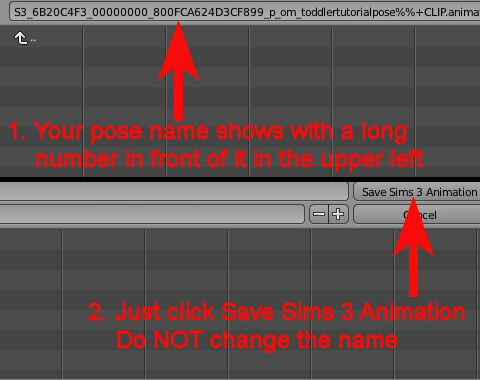 it will help you get the “Sims 3 Animation” option when you export your pose. Hi! I am having an issue when I test this particular pose in game. It appears that the pose is always either higher or lower than it is in Blender. I can’t get it to look exactly how it looks in Blender. How can I fix this? When I select A it also selects all the cameras. I don’t think I want that, so I deleted them and just selected the joints on the sim. Is that right? When I click 7 in the 3d grid mode it my sim just disappears. I think it is because I don’t have a number pad on my laptop. Also I can not scroll because I do not have a mouse. 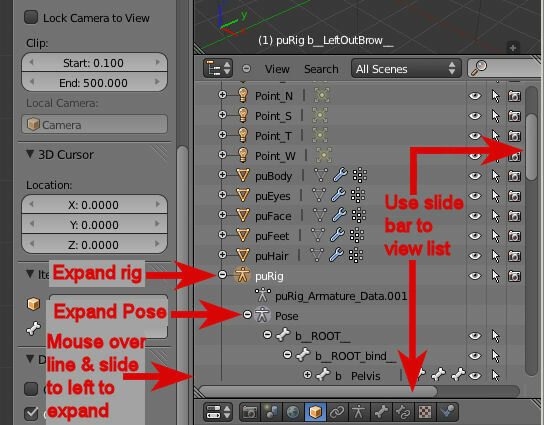 My poses list didn’t showing up in pose player, what to do? they might not be pose list compatible, idk. 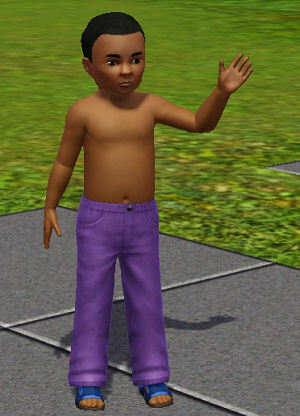 My toddler poses strech to adult stance in game and I’m sure I named it right! My kid poses work fine! Why toddler? Where do I find the “rigs” at? I installed the ClipTool thing like the pictures said and when I go to load the rig, it brings me to the folder where I installed the Add-on from. Nowhere does it tell you how to reach the rigs. Where are the rig files located? Where do I get “rigs.rar?” It wants me to make a new folder and extract the folder but nowhere does it tell you how or where or by what means this file is downloaded/found. Found it. Was on the downloads page. Did not go through all of them. Hi, so I did all the steps, but when I pose my sim, he does not do the pose? Did I miss something? 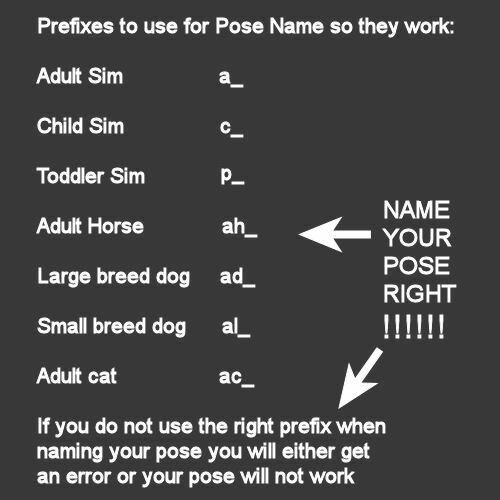 It means you didn’t name the pose right, when you type the pose in it should be (( p_posename2 )) p_ for toddler. a_ for adult. c_ for child and so on.. I have the same problem, I rechecked the name 100500+ times, I tried other names, other Blenders, other rigs, I used all ages, sexes and species, but all that sims do is stand in default adult pose instead of pose created by me.